These species are bigger than its other contemporaries. 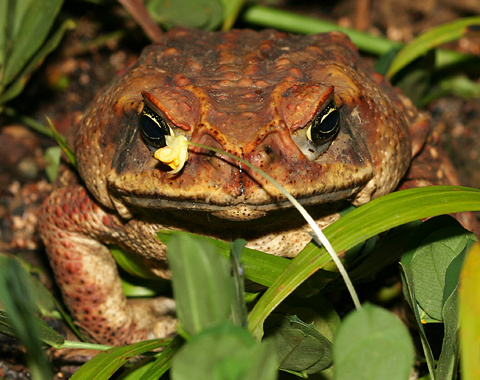 The Cane Toads expand their lungs to attract their predators. They always prefer moist and humid areas where a minimum of 70% humidity is desirable. They have a tendency to have external fertilization. The period taken by the eggs to hatch varies largely. Sometimes they might hatch within a week, at others they might take up to a fortnight. They have a very low survival rate. It is very striking that only 0.5 % become adults. 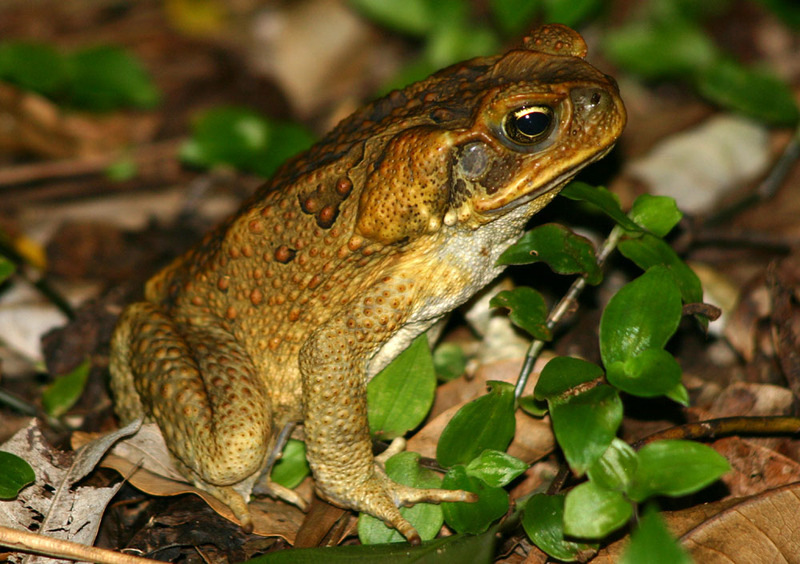 Size of the cane toad: The length of these species varies between 4 to 9 inches. 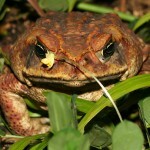 Weight of the cane toad: Their weight is generally measure around 1.8 kilograms. Color of the cane toad: These species are available in variety of colors. The more popular ones are olive brown, yellowish and reddish brown. The lower portion of their bodies is yellowish or pale white in color. They also have striking odd dark colored mottles running through their body. 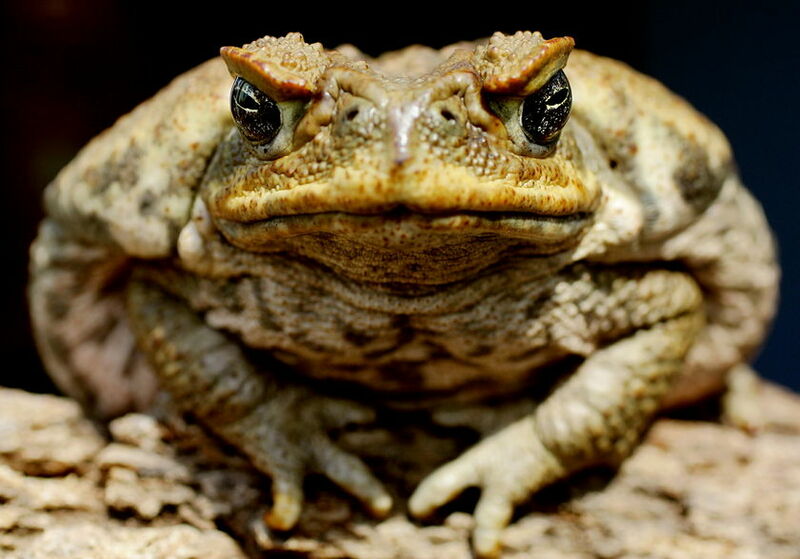 Head of the cane toad: The head resembles a triangular shape .The ears are placed on either side of the head. Beneath the ears, there is the parotid glad. This secretes toxin. Body of the cane toad: These species possess a rough skin. Moreover, their legs are short and suitable for jumping from one place to another. These species are found in the parts of subtropical forest in water areas. They also inhabit in the dry areas that are humid. However, during the period of reproduction, they tend to cling to wet areas. These species always like to feed on insects. They can also assimilate other small animals like lizards, fishes, birds, frogs, worms, bees. One interesting fact is that the older ones prey even on juvenile ones. · They have a tendency to sit still and leap for only short distances. · They mostly active in dark and are fund roaming at night. · They always prefer to thrive on wetlands, which is why they need good humid conditions. 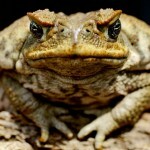 · The cane toad calls aloud to their partners when they wish to breed. 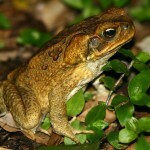 · The juvenile cane toads are active during the day as well as at night. They have many predators in their immediate wild world. The common ones are mainly the cat eyed snake, flagtail, killifish, catfish etc. 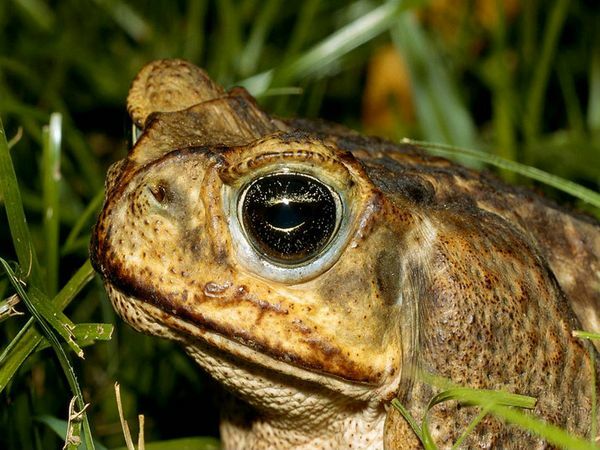 Cane Toads have an amazing system of keeping safe from their predators. Their bodies begin to secrete bufotoxin, a toxic fluid that is fatal to most predators, whenever they sense danger. In fact, these secretions of the cane toad are fatal to human beings as well. The prime times for their mating are the months from April to September. The females usually lay a clutter of jelly like eggs. There are an astounding 8000 – 35000 eggs in each such clutter. The eggs undergo external fertilization. The males also contribute in order to get the eggs matured. The eggs, on fertilization look more blackish in color and smaller in size. It takes only 48 hours for the tadpoles to come out from the egg. Such hatching period can, in some cases, be as short as even 14 hours. The time taken by tadpoles to get transformed into toadlets ranges between 12 to 60 days. 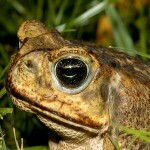 The cane toad span a normal life for about 10 to 40 years. Those wishing to keep cane toads as pets should definitely check out the following pointers to ensure proper care of their loved pets. House required: A 30 gallon tank is one of the very basic requirements of cane toads if they are to be kept as pets. They feel at home in a wild environment that can be artificially created with the help of tree barks supplemented with adequate gallons of water. Temperature needed for Cane Toad: One should make sure to keep the humidity levels within the range of 70% to 100%. Less humidity can be lethal for these species. Foods of Cane Toad: These species are carnivorous. They like to feed on all kind of insects. Maintenance of Cane Toad: One should be very careful while handling them because their bodies secrete poisonous toxin. According to the IUCN report, these species are in the list of least important ones for preservation. Their food habits are what keep them safe.